On this last day of March I’m making a last ditch effort to post a new recipe before we turn the calendar to April. Although it’s been rather quiet here at brownberry tales, on my side of the screen, it’s been business, and busy-ness, as usual which has led to the starting, but not finishing two other posts. Every once and awhile I hit a meal planning slump (such a depressing, clunky word, right?). But honestly, it’s challenging to maintain enthusiasm when planning meals for six palettes that don’t always agree on what tastes good, especially when it comes to plant-based recipes. As a high achiever who loves her family, I want all my peeps to enjoy what they are eating. Since inspiration was lacking from traditional dinner recipes, last night, I turned to breakfast. Inspiration found! The recipe I’m sharing today is not the one I served last night (pancakes), but it is the recipe I used for a topping. 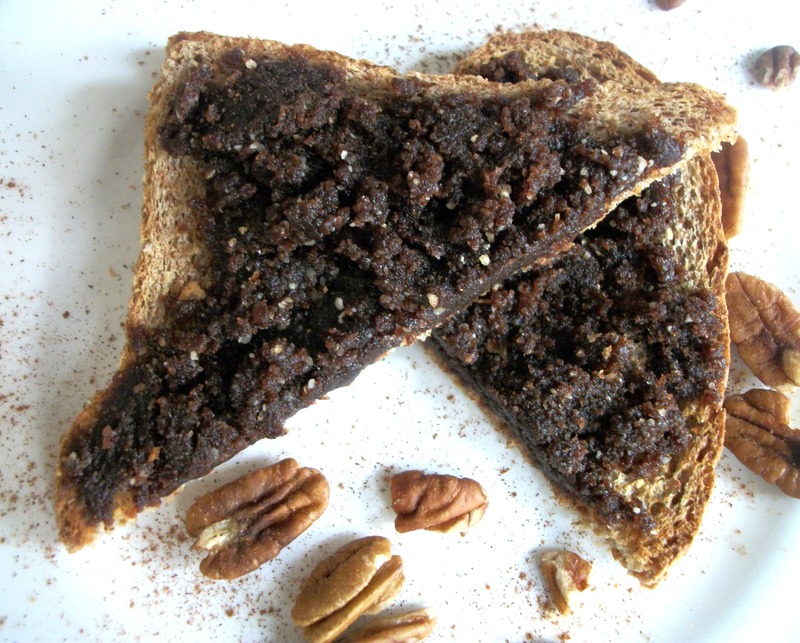 After whipping it up, it reminded me of the cinnamon-sugar topping I used to put on toast. I still have vivid memories of toasting a piece of bread, slathering in with butter, then sprinkling on the cinnamon-sugar mix. Yum! But not so great for the teeth or the body. 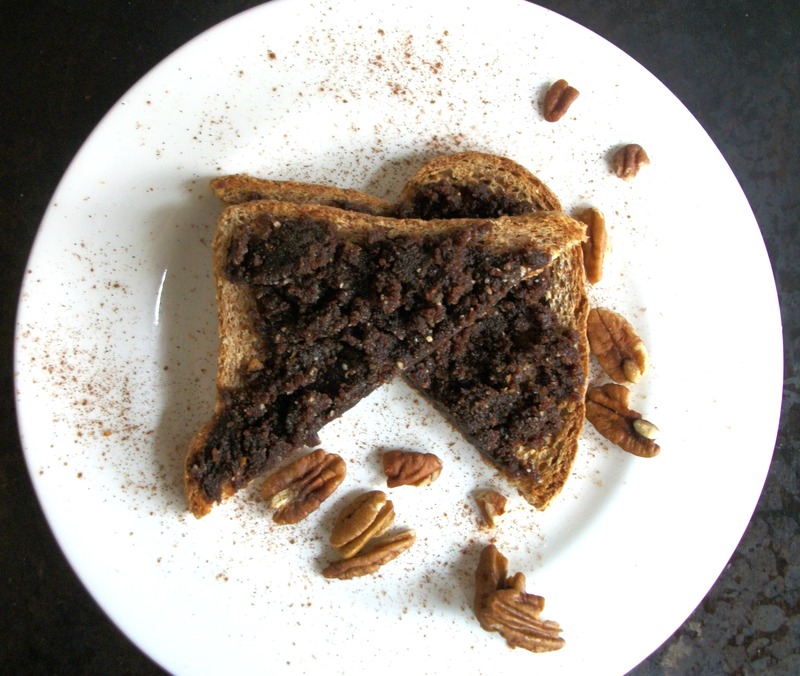 Place all ingredients in a food processor and blend until the oils release in the pecans and the mixture begins to clump together and becomes spreadable. This may take 3-5 minutes. Spread on toast and store any leftovers in the fridge. Bring any leftovers to room temperature before using. Despite the warmer weather today, I know we’re not quite in the clear yet…a few weeks of wintery weather may still be upon us. Which means there will be many days left which call for the warming dishes of comfort food. Last week, I turned to my quarter-Polish roots to prepare a vegan twist on the traditional cabbage roll. For the longest time, this was one dish that I never warmed up to until recently. I think it was the unusual color + size of the cabbage leaves that was a turn off. But ever since I learned more about my great-grandparents who emigrated from Poland to Canada in the late 1920’s, my appreciation (and apparently, appetite) for this part of my heritage has grown. 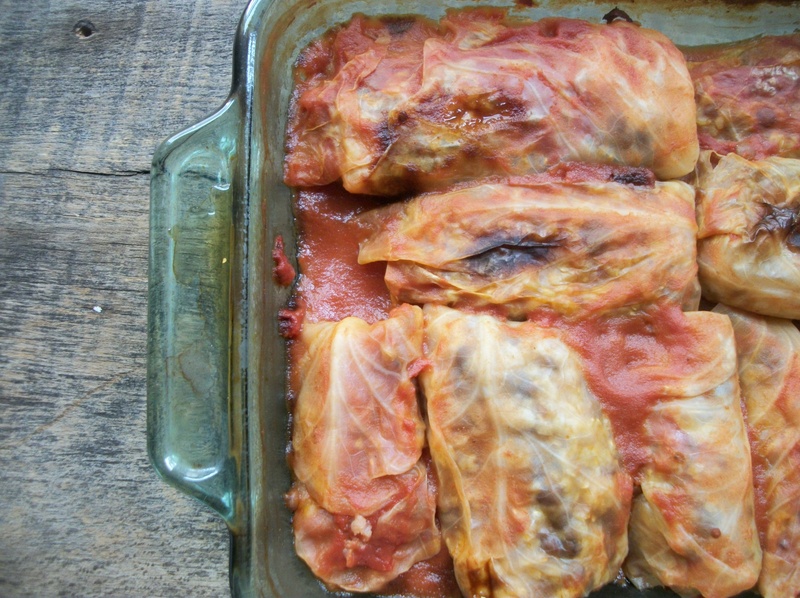 Traditionally, cabbage rolls are prepared with ground pork, salt pork or ground beef combined with rice and onions. This recipe is based on the one my mother gave me, but I incorporated some coconut bacon to approximate the flavor of salt pork. Despite the length of prep and cook time, this dish is simple to prepare. So, what kind of dishes have you grown to love? Cook rice in 1 ¾ c. water until liquid is absorbed. In a separate pot, cook lentils in 1-1 ¼ c. water until tender. Meanwhile, sauté onion and garlic in dairy free butter until tender; set aside. To prepare cabbage leaves: place cabbage head in a large pot of boiling water. Use tongs to remove leaves one at a time as they become softened and loose (about 20-30 seconds between each leaf layer). Set aside. When rice and lentils are cooked, combine, then mix in coconut bacon and seasonings. Cover the bottom of a glass baking dish with tomato sauce and place rolls seam side down into dish (you can do this as you roll each one). When all the rolls are prepared, pour remaining sauce over the rolls until they are almost completely covered. Cover with foil and place in a 325 degree F oven and bake for 2-3 hours, turning down the temperature if needed to prevent burning. The rolls are cooked when most of the tomato sauce is absorbed. Add all ingredients to a bowl and stir to combine. Mixing by hand can help the liquids coat the coconut. Let the mixture stand a few minutes while oven preheats to further aid absorption. Spread coconut onto a baking sheet lined with parchment paper. Bake 7-8 minutes, remove pan from oven, stir, then return pan oven. Bake an additional 7-8 minutes, stirring once or twice to help coconut bacon cook evenly. Depending on the size of your cabbage leaves, you will need anywhere from 12-18 leaves for this recipe. You can use the remainder of the cabbage in other recipes. Cabbage rolls are formed similar to burritos or spring rolls. There are online tutorials of how to roll them if you are unsure of the correct method. For the coconut bacon, you can use tamari or soy sauce in place of coconut aminos, but you will need to adjust the salt content. I like using coconut aminos because it is free of additives often found in soy sauce and tamari and it has a lower sodium content. Vitacost.com* offers a great price per bottle. I use Wright’s Hickory Liquid Smoke because it is one of the few liquid smoke brands that is free of sugar and other additives. The weather finally is whispering spring. My children actually want to play outside. I wore shoes, not boots, outside for the first time since I can’t remember when (not counting my time in the DR). Today the boys rode their bikes to school. Yet I know we’re not in the clear yet…a spring snow is still a possibility. And here is a, perhaps unconventional, recipe; a nod to this betwixt and between time of eating winter’s comfort food while looking forward to spring’s fresh raw green. 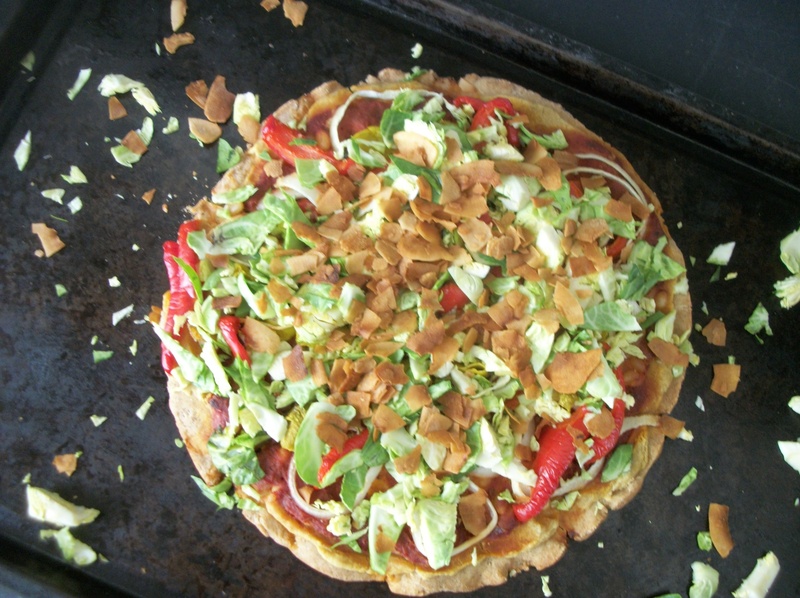 It’s a pizza featuring the warming heat of peppers and topped with raw Brussels sprouts and coconut bacon. Considering I spent much of my life convinced I did. not. like. Brussels sprouts (I even tried convincing my mum I was allergic to them), I find it humorous that I now try to find ways to work them into a recipe. Though I still am not a fan of a cooked sprout, I do enjoy them in the raw. If you enjoy the taste and texture of cooked Brussels sprouts, by all means roast away, but I like the contrast of warm pizza with cool greens and knowing that the heat hasn’t killed all their micro-nutrient goodness. The coconut bacon recipe comes from a recipe pack Angela at Oh She Glows offered with a pre-buy of her cookbook*; I tweaked it slightly. If using a homemade crust, pre-bake it for five minutes. Spread on hummus, then sauce. Sprinkle garlic powder and dried oregano, then add pine nuts if using. Add onions, peppers and pepperoncini and bake in over for about 15 minutes or until crust is lightly brown and veggies are tender. Top with raw Brussels sprouts and sprinkle on coconut bacon. Serve. You can use tamari or soy sauce in place of coconut aminos, but you will need to adjust the salt content. I like using coconut aminos because it is free of additives often found in soy sauce and tamari and it has a lower sodium content. Here’s where I order it on vitacost.com. Although the bacon is soft when it first comes out of the oven, it hardens as it cools. I like using red pepper hummus (especially Sabra’s Red Pepper Hummus) for the extra flavor dimension it offers, but feel free to experiment with your favorite kind. 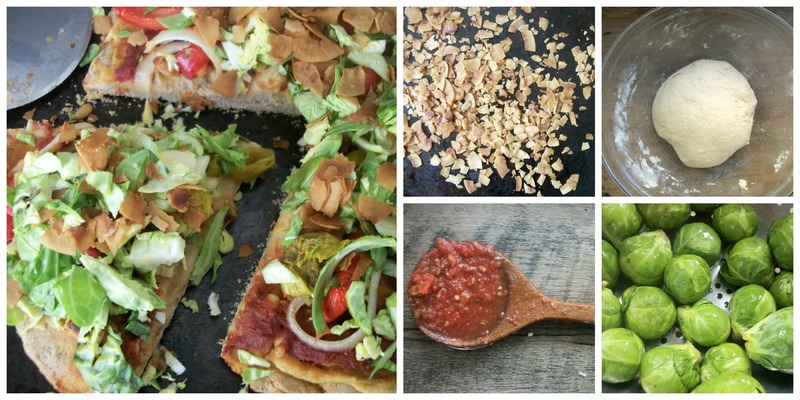 Hummus is key as it mimics the moisture and flavor cheese adds to pizza. I use Jeff’s Naturals brand for my pepperoncini because it doesn’t contain the preservatives found in most brands of pepperoncini found in grocery stores. I get mine a natural foods grocery store. Sprinkling on garlic powder and dried oregano helps boost flavor. To judge quantity, I make my pizza in a 9-inch cake pan and use about ½ onion, one small red pepper, ½ cup of pepperoncini, 4-5 Brussels sprouts and ¼ cup coconut bacon. But feel free to adjust to your personal taste. * *I am an Amazon associate. If you purchase the cookbook through this link, it will provide a small credit to my account. When my children were little, we discovered this book at the library. It included a recipe for pizza dough in the back and we decided to give it a try. Friday pizza nights with the “Pizza for Everyone” crust quickly became a family tradition, one that was often accompanied by a movie. Though we don’t strictly adhere to this tradition all the time, I usually plan for pizza night once a week (and make a few extra personal pizzas to tuck into school lunches). I’ve adapted the original recipe to include whole grains and reduce the gluten content. I’m also sharing a second version of the dough strictly as a printable PDF. This second version uses a 2:1:1 ratio of unbleached, all-purpose white flour to whole wheat pastry flour to brown rice flour because it’s hard to sell my husband and children on the crust I prefer to eat. A single batch of this dough yields two 9-inch pizzas and I can get a double batch of the dough to make one large thin crust pizza on a cookie sheet, plus 3-4 small personal pizzas. The dough also freezes well, so when I make my version of the crust, I split it in half, popping half of it in the freezer and turning the other half into dinner. Gently stir yeast and sweetener in a bowl with the warm water until combined. Let the mixture stand until bubbles begin to form (a.k.a proofing the yeast). This takes about five minutes. Stir in olive oil, then mix in flour and salt. 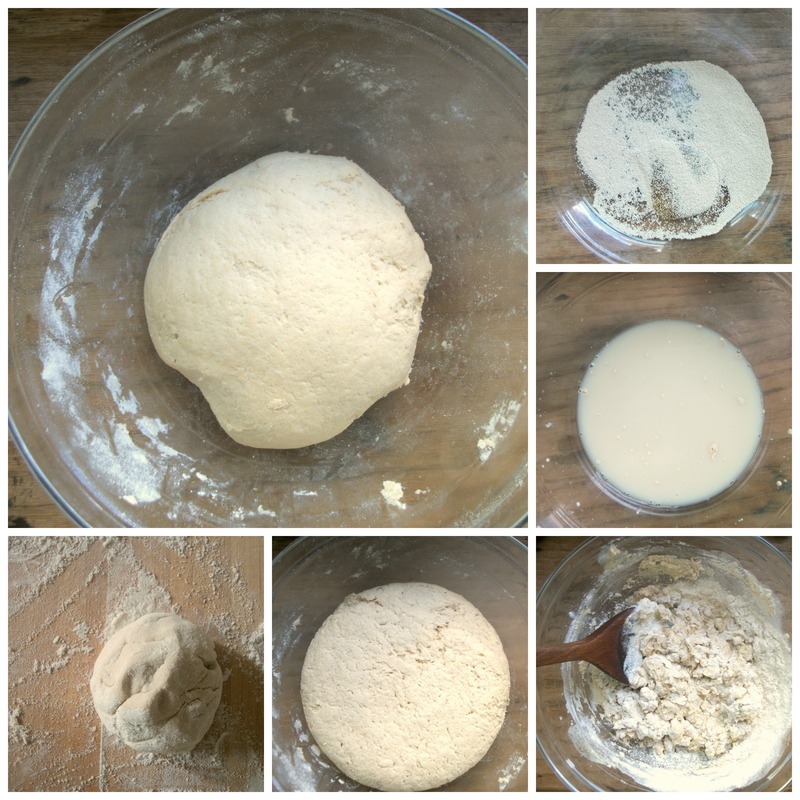 Knead 3-5 minutes until dough is smooth and pliable. Form into a ball in the bowl, cover with a damp towel and let rise in a warm spot for 60-90 minutes. On a lightly oiled pan, press dough into desired size and shape, then pre-bake in a 350 degree F oven for 5 minutes to set the top of the crust. Add desired toppings and cook an additional 15-20 minutes. The right water temperature for the water is key to a good dough…too cold and the yeast takes a long time to work, too hot and you kill it completely. If this is your first time working with yeast, you might want to try using a thermometer to get the right water temp. Avocado oil is a better choice for foods cooked at medium-high temperatures like pizza because it can withstand high heat. If you are saving some of the dough for future use, wrap it in a couple of plastic bags and store it in the freezer. You can do this before or after pre-baking it, but I found freezing it in raw dough form to better. Feel free to experiment with your own combination of flours, though texture and results may vary. For the longest time I could not bring myself to eat pasta with sauce on it. Chalk it up to getting the flu after eating spaghetti for dinner. Instead, I requested my spaghetti be served with Italian Salad Dressing. Years went by until I worked up the nerve to start eating pasta with a little bit of sauce, but it wasn’t until I went to Venice, Italy as a senior in high school that I finally understood why people love pasta. I started making my own sauce a few years ago when I switched to eating vegan and also cutting back on oils (most store bought sauces contain oil and many also contain sugar). The inspiration for this recipe comes from the Prevent and Reverse Heart Disease book which also inspired my change in diet. Since we are a family of six and this sauce freezes well, I make a large quantity. That way, I only need to prepare this about once a month. It makes enough to fill about five large mason jars plus a few smaller jars for pizza sauce. When I don’t have tomatoes on hand from my garden, my favorite brand of canned tomatoes are Muir Glen’s organic diced or whole tomatoes because 1. they’re organic and 2. Muir Glen took the BPA out of their can lining. Thankfully, I can buy these in bulk at BJs to save money. In a large stock pot, sauté onions and garlic with a little water to prevent the vegetables from sticking. Meanwhile, in a blender or food processor, blend tomatoes in batches to desired sauce consistency. Add blended tomatoes to stock pot along with other ingredients except the tomato paste. Simmer at least 30 minutes or longer to let flavors develop. For pizza sauce, set aside several cups of the pasta sauce and stir in tomato paste until thoroughly combined. Doing so in a medium saucepan over medium-low heat helps with this process. 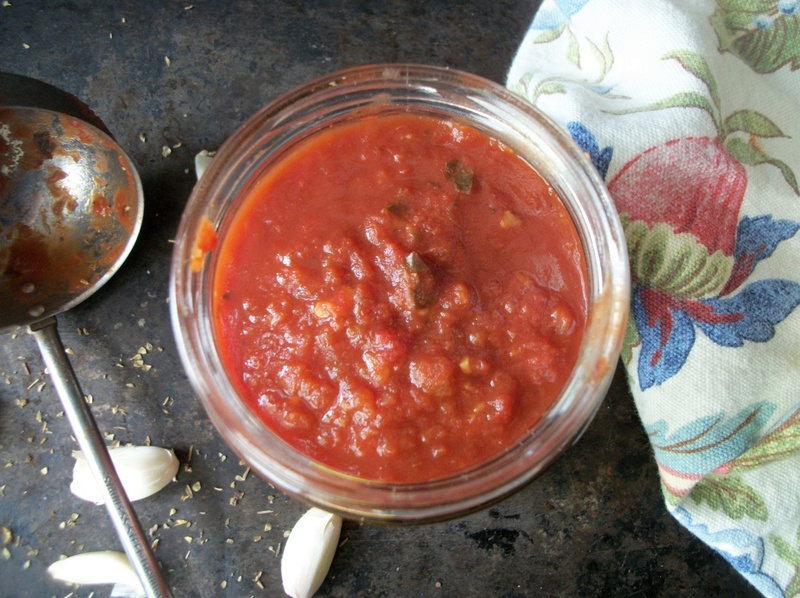 I use Muir Glen’s organic whole or diced tomatoes and blend them to a fairly smooth consistency. Garlic is the key to a tasty sauce, but if you’re not a big fan of garlic, start with a slightly smaller quantity. This recipe makes a lot and it freezes well. One batch usually yields enough sauce for 3-4 pasta meals plus 3-4 pizzas. 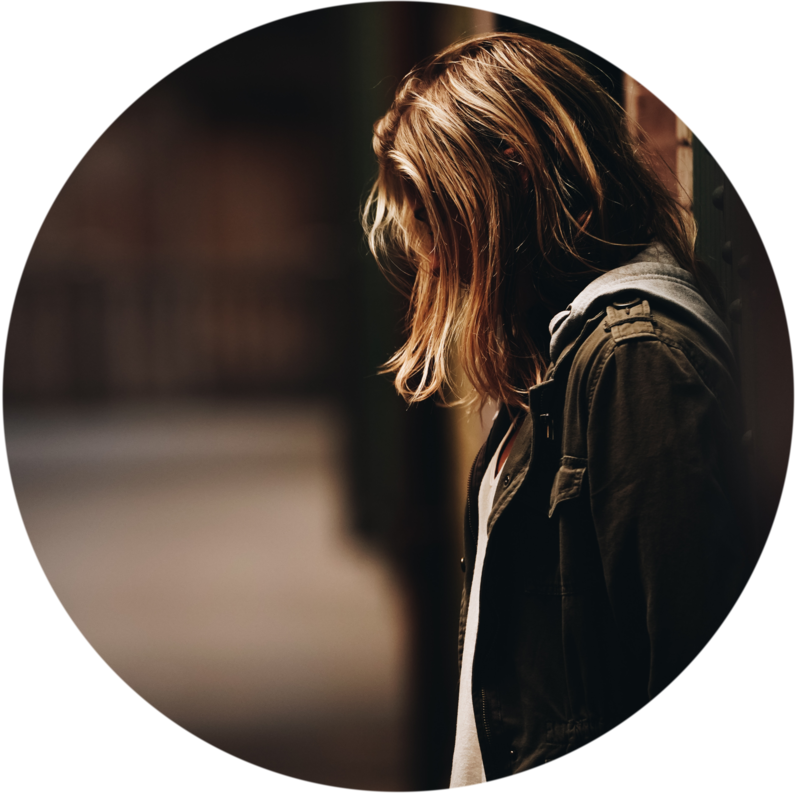 You know how it can be really frustrating when you have so much to accomplish during your day, but you’re constantly battling fatigue, stress and mental fogginess? Or you feel like you constantly have to choose between your health or your to do list? Or you’re convinced you’ve tried all.the.things but they haven’t stuck? What if you had someone to help you break that cycle? Someone who helped you figure out exactly what your body needs to function at its best and in a way that naturally flows with the demands of your day? Someone who believed that you were meant for wonderful, beautiful things and wants to help you live your life to the fullest? Hi! I’m Andrea…your Lifestyle Wellness Coach. I help you navigate all of these challenges and support you as you learn to listen to what your body is telling you it needs. Together, we craft a healthy lifestyle plan and break it into manageable steps that feels fun and easy to put into action. And, if and when you’re ready, I also can help you fight the fear out of eating less sugar and more plants. At the end of our time together, you will feel confident about who you are and energized by what your healthy body is able to accomplish. Want to learn more or get started? Head to the top of the page and click on the GET YOUR FREE CALL link. Tired of struggling with your addiction to sugar? Afraid that life will be so...depressing without it? What if I told you that you could immediately start cutting back on your sugar consumption and you wouldn't even miss it?! You see, food manufacturers slip sugar into their recipes because it keeps you addicted and craving more of their product. Creepy, right? But for many of these products, added sugar has no business being there in the first place and you won't even miss it if it's gone! It's 100% free for you to download when you sign on for VIP access to my newsletter. a Sneaky Snacks recipe book containing some of my favorite added sugar free desserts and snacks that are easy to make + fun to eat. 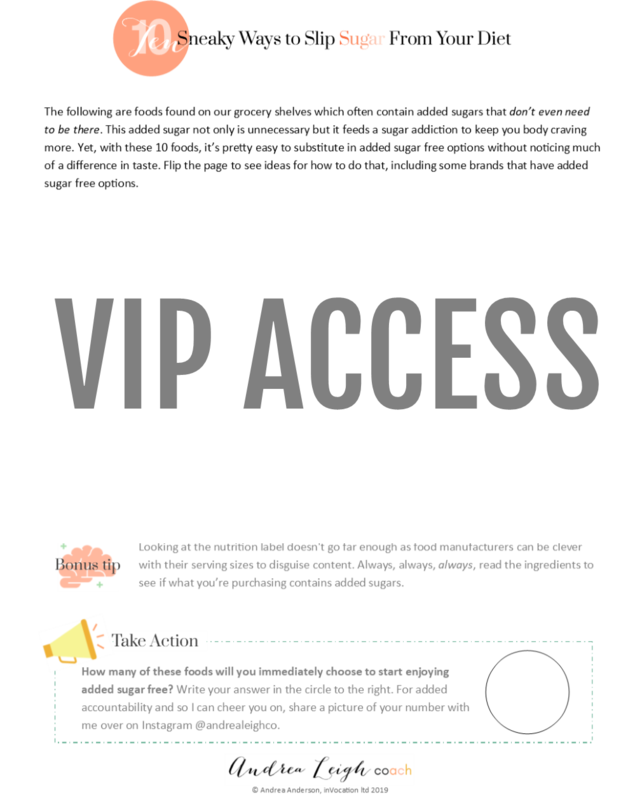 How do you become a VIP and gain access to all these goodies? It's easy! Simply fill out your name and email address and click the "GET MY FREE DOWNLOAD" button. And that's it. Yay! Welcome to the VIP club. Now go check your inbox for the email I just sent you with your free "10 Sneaky Ways to Slip Sugar from Your Diet" I also include a tip on how to make sure my emails get past your email spam filter ninjas. ;) If you don't see it in your inbox, then your filter ninja probably captured it and is holding it prisoner in your junk/spam folder. Go rescue it! If you don't see it there either and it's been a few minutes, email me at andrea@andrealeighco.com. I'll track down what went wrong and, of course, send you the list lickety-split.